Someone else who appreciates what the SEALs do? Washington, which should be a good thing for the unit but there's a catch. Politicians are saying we should have more of that good thing. More SEALs. Not necessarily a smart move, Denver said. "It scares me, I am going to be honest," he said. "I think the risk is we don't know what the unintended consequences of getting more. The program works. We know what the results are with the program right now. If we double it, triple it, increase it by half, we don't know what that result will be." He noticed, for example, that in some training exercises guys who fail are getting more and more chances to try again, like 10 or 12 times. "I am concerned about 12 attempts to get through a program where it used to just be four," Denver said. "But I was also cognizant as we were going through training that one of the things that is difficult is not letting those instructors get away from that focus on making it harder, to make it better. So that is really the tough part. Saying where is that cut off point." Usually there are about 2,000 SEALs in service. Many more apply and start the training and most don't make it. So what does it take? "I think it's a lot of things," Denver said. "If we could bottle it-- if you and I could bottle this right now we'd be retired on an island somewhere because it would be hugely valuable. I think it's a tremendous desire to succeed, I think it's an absolute inability to quit, no matter how tough things get." That's why they call themselves the "damn few." 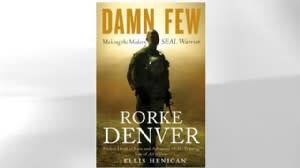 Something more of us know because the SEALs, in books like Denver's, are coming just that much more out of the shadows.